Get ready for a one-of-a-kind adventure as you drive a Scoot Coupe 2-person, 3-wheel scooter that looks like a miniature convertible car! Your professional, English-speaking guide will provide driving instruction and helmets before you head out on the road. You will then join the caravan and discover the island of Cozumel on a scenic joyride like no other. 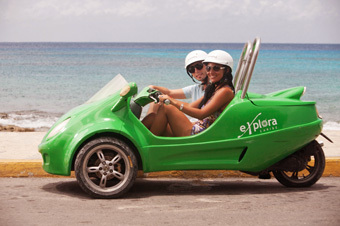 You will drive to the northern side of the island, which is also the first area of that was developed in Cozumel. This makes the Northern are of Cozumel the most important historically for the Island. The tour will then stop at the Mestizaje Monument right in front of the beach; the guide will walk you through the area explaining how the local indigenous people after some time began mixing races with the Conquistadores from Spain. This is also a great photo opportunity. After that you’ll head out of town and into the Northern more scenic side of the hotel district. We’ll stop at staple of old Cozumel where the beach and crystal blue waters meet. Here is where you will have free time to relax in the sun or go for a swim. This Beach Club is famous for the blue waters and friendly typical Cozumel feel. Play a game of beach volleyball, take a stroll, snorkel from the beach, or just bask in the sun. The scene is perfect to take in Cozumel for all its wonders. The next stop is downtown, where you’ll have time to shop or go for a walk at the main downtown plaza. Once an hour of shopping and getting to know the local down town area is up, your guide will lead you back to the comfort of your ship.